Vårt fjädersmycke i silver imiterar två svanfjädrar. Där de möts formas ett hjärta. Det är 5cm och väger 14g. Om du önskar beställa till en silverkedja på 45 cm tillkommer en kostnad på 200 Sek. 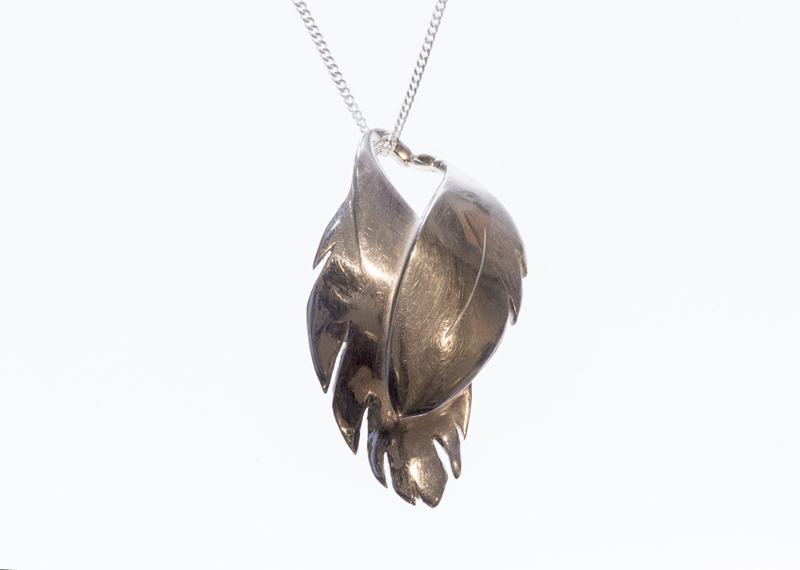 Our Swan feathers in silver forms a heart where they meets. It is 5 centimetres and weights 14g. At this date we only sell with either ”Cash on delivery” or ”Prepayment”. Our bank giro number is 434-5591 but most of our web-costumers contact us before they place an order. Be careful to report your full name and address, as well as the name of the product you are buying. Since we are producing all of our models ourselves not all of them are in stock at any given time, but be assured we are working hard to complete your order as soon as possible. Since we also is a bodily store in Kungsbacka/Sweden you can off course visit us there as well.